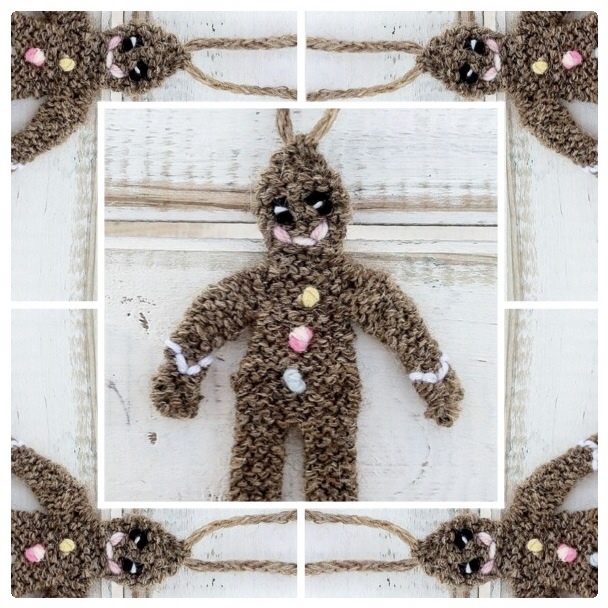 For the body of the gingerbread man you will need a brown yarn, or one that feels festive. You can also choose a yarn with spots, sparkles or a metallic thread; there are lots of great ones out there. Pick a warm colour, one that nudges slumbering memories, rewinding you back to a winter kitchen with a real fire, an old-fashioned kettle, a table laid with cakes, carols on the radio, a cat on your lap and the company of your favourite person. Perhaps it is a time of learning – with mother or grandmother or an older, wiser friend? Perhaps you were baking cakes, making decorations, glueing and sticking cards? Maybe you were knitting your very first item, a scarf? Make it bright and colourful. Make it warm and safe. Make it something you would like to recreate. Now: what colour speaks to you? That’s the brown you should pick. I chose several shades, experimenting with colour and texture: one light, like milky coffee; one dark, like the outer crust of wholemeal bread; and one mid-toned, almost ginger. My favourite was the little man below. The yarn was alpaca and slightly textured and I made it with needles one size too small, to give it a slightly felted look. It made my man appear more solid, sewing buttons and facial features that much easier. Ideally, these should be black, although it is up to you what you want your gingerbread man to look like. I chose black and then gave him white pupils. These should be red or pink. They should also be the same weight as the gingerbread man himself and the eyes; so if you chose a DK, stick to that. Again, these can be in whatever colour or yarn you like – just stick to the weight you used before. Choose a pale colour: white, pink, yellow, blue, etc. Make it look edible, too. My recommendation would be to choose a medium-weight yarn, one that requires 3 – 4 mm needles. Those with more experience can experiment more. My men were 2 and 4ply alpaca and 4ply merino and my needles were 2, 2.5 and 3 mm respectively. Note: the thicker the yarn, the larger the gingerbread man; so don’t go for a chunky wool, unless you want a giant biscuit. To match yarn. So if you have bought a 4ply, your needles will need to be between 3 – 4 mm. If you want to make him look slightly felted, don’t forget to go down a size. In which case, pick 3 mm. Wooden are best. But you can use plastic or metal, too. KnitPro make some lovely ones. Other brands are Hiya Hiya, Pony and Milward. Materials can be bought in all independent yarn and haberdashery shops, some pound and Chinese shops, selected department stores and also online. If you are unsure of what to pick, be sure to ask for help at the time of buying; most shop assistants are lovely and only too willing to help.